Understanding the Political World 12 Edition NOTE: You are purchasing a standalone product; MyPoliSciLab® does not come packaged with this content. If you would like to purchase both the physical text and MyPoliSciLab search for 0134113934 / 9780134113937 Understanding the Political World plus MyPoliSciLab for Comparative Politics — Access Card Package, 12/e, which contains: 0133941477 / 9780133941470 Understanding the Political World, 12/e 0134064054 / 9780134064055 MyPoliSciLab for Comparative Politics Access Card MyPoliSciLab should only be purchased when required by an instructor. For courses in Introduction to Political Science Grasp the Ever-Changing Nature of International Politics Understanding the Political World gives readers deeper insight into the continually evolving nature of international politics. Presenting key concepts, relevant research findings, and detailed explanations, the Twelfth Edition offers readers a path to understanding the challenges of politics and political differences. The text explores the subject matter from a comprehensive and comparative standpoint, using real examples from different international political systems to demonstrate how politics are understood throughout the world. 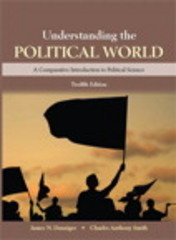 By directly questioning readers to understand and explain what they know, Understanding the Political World brings an abstract subject into focus by relating it to readers’ opinions and lives. Through real examples of political institutions and processes, readers can better understand the nature of global politics. Also available with MyPoliSciLab MyPoliSciLab for Comparative Politics courses extends learning online, engaging students and improving results. Media resources with assignments bring concepts to life, and offer students opportunities to practice applying what they’ve learned. And the Writing Space helps educators develop and assess concept mastery and critical thinking through writing, quickly and easily. Please note: this version of MyPoliSciLab does not include an eText. Understanding the Political World, Twelfth Edition is also available via REVEL™, an immersive learning experience designed for the way today's students read, think, and learn.